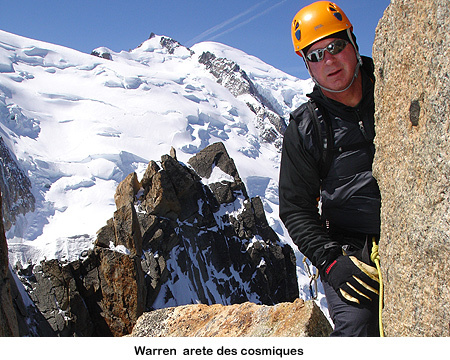 Photo #1: Warren is my father-in-law and he is really getting into climbing and hiking. The past spring he put together a Haute Route trip with his friends and colleagues at Sugarloaf Ski Area in Maine that I guided with my wife Nina. 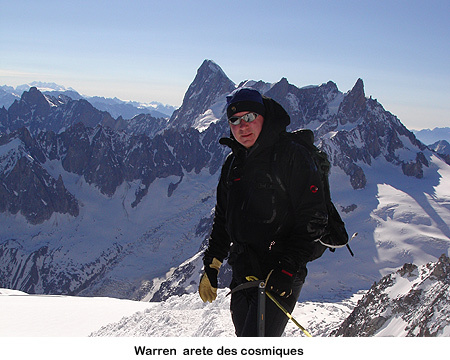 On this day, he was in the area on business so we scheduled to spend a day in the high alpine. 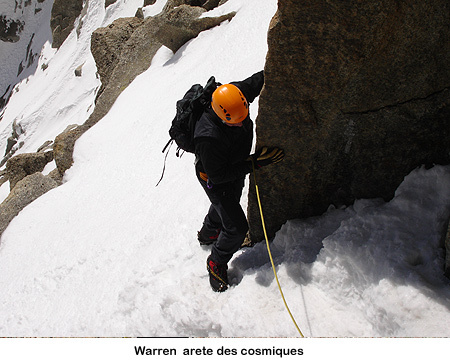 We climbed the Arete des Cosmiques above Chamonix . 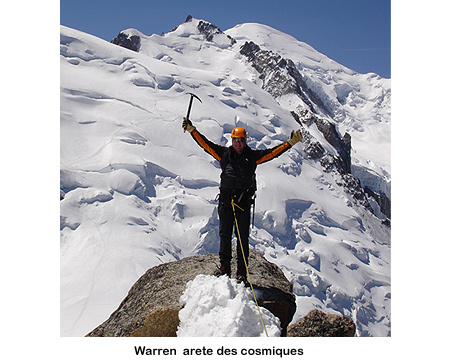 It is an easy alpine climb on snow and rock that you usually do with crampons on the whole way. 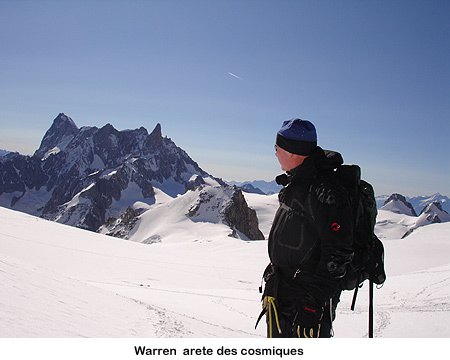 You get exceptional views of the Mont Blanc range and today we were not disappointed. Here, we are walking out the snow tunnel after taking the tram up the Aiguille de Midi. You walk down this snow ridge and around to the base of the route. 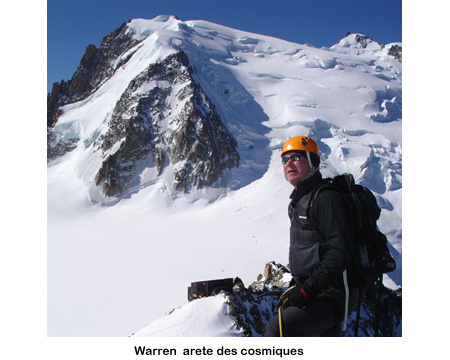 You then end up back at the station on the Aiguille de Midi and hop on the tram back to Chamonix in time for afternoon tea. Photo #2: On the way to the start of the climb we stopped to enjoy the views of the Grandes Jorasses and the Dent du Geant (Giant’s Tooth). Photo #3: Looking up at our route with Mt. Blanc du Tacul behind us. Photo #4: Getting into it. 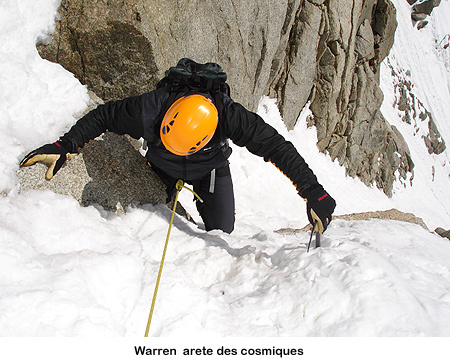 Photo #5: Learning how to climb with crampons on rock. You wouldn’t want to stop and take off your crampons every time you got to some rock. 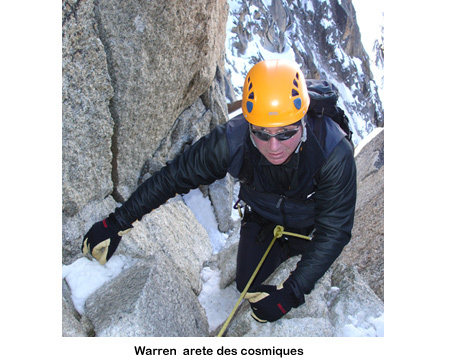 It is more efficient to leave them on and also gives you surprisingly good grip on the golden granite. Photo #6: Enjoying the climbing. Photo #7: Turning an awkward corner. 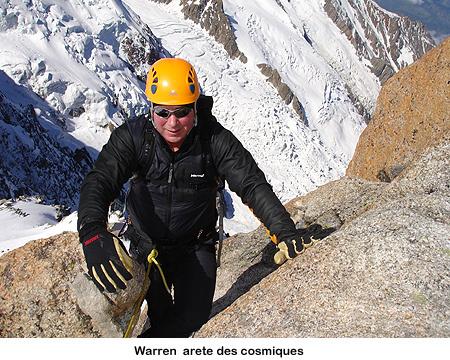 Photo #8: Up a snow couloir. Photo #9: What a view today. We had no wind and clear blue skies. And, being early June, we so no one else on the route. Photo #10: A pause to eat. Of the over 50 times I have done this route, this was the most relaxed trip. There was literally, not one other climber on the route and it was warm and sunny. 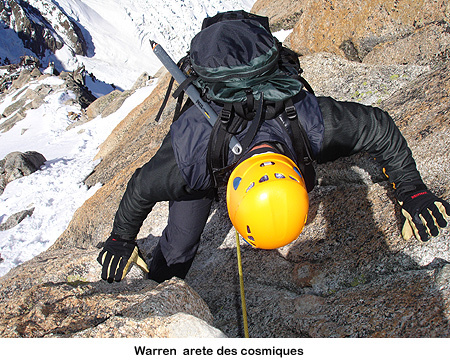 Photo #11: Climbing up the final north facing couloir back into the sun. Photo #12: Striking a pose on the summit! 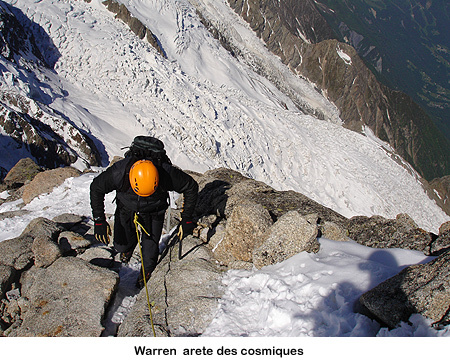 This is one of the best climbs in the Mont Blanc Range and on almost every alpine trip I do in Chamonix , I try to get people on this route. 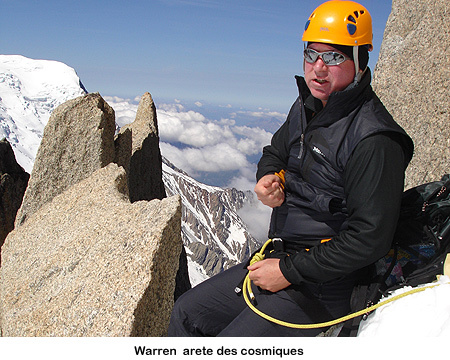 It is not too long for doing early in the trip but has super dramatic climbing with close amazing views of the big famous peaks in the Mont Blanc Range.